WALLACE — In this once-stately northern Idaho mining town, townsfolk defend time-honored traditions with vigor. Nobody dares to know their hard-rock mining legacy, their turn-of-the-century buildings or … their whorehouses. Priests and politicians, including Gov. Cecil Andrus, have tried repeatedly in the past 15 to 20 years to board up Wallacce’s famous brothels with little success. Even when the silver mines closed in the early 1980s, causing the economy to reel from 40 percent unemployment, the brothels somehow survived. 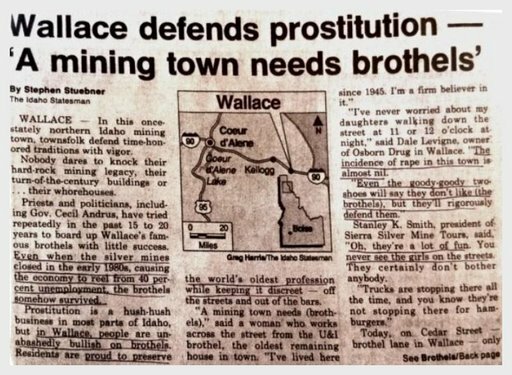 Prostitution is a hush-hush business in most parts of Idaho, but in Wallace, people are unabashedly bullish on brothels. Residents are proud to preserve the world’s oldest profession while keeping it discreet — off the streets and out of the bars. This entry was posted on Thursday, March 26th, 2015 at 9:49 am. You can follow any responses to this entry through the RSS 2.0 feed. You can leave a response, or trackback from your own site. I grew up about an hour’s drive from Wallace and we lads were well aware of the lure of the place. The U&I, in particular, had a high reputation for beauty and talent. But in general the Idaho panhandle was and still is a wild and woolly place full of pot farms, white supremacist enclaves, bars with chicken wire protecting the stage, and of course, the reputed, but seldom verified, devil worship in the hills above Rathdrum.